After more than a year of Colin Kaepernick and other NFL players sitting and kneeling during the national anthem, the controversy over their protests has reached a tipping point. More players than ever before knelt or sat during the anthem on Sunday, after Trump argued that those who did so should be suspended or fired. On Friday, Trump said: "Wouldn't you love to see one of these NFL owners, when somebody disrespects our flag, to say, 'Get that son of a b---- off the field right now, out ? he's fired!'" Some NFL fans who agree with Trump showed their support of the president ? and their anger at players ? by burning their teams' merchandise. "We have morals in this country. We stand for this country," Smith says in the video, which has more than 50,000 views as of Monday afternoon. "My great-uncle's bones are lying in the bottom of Pearl Harbor for this country, for this flag, for your freedom to play in the NFL." "Super Bowl, right? As if I care," Smith continues, pouring lighter fluid on the gear. "I care about our country. I care about our freedom." Smith wasn't the only fan taking action and posting evidence online. At least two groups of Baltimore Ravens fans posted videos of themselves burning merchandise on Sunday. Some players on the Ravens stood arm-in-arm during the anthem, while many others, including Mike Wallace, Tony Jefferson, Terrell Suggs, and former Ravens linebacker Ray Lewis, chose to kneel. 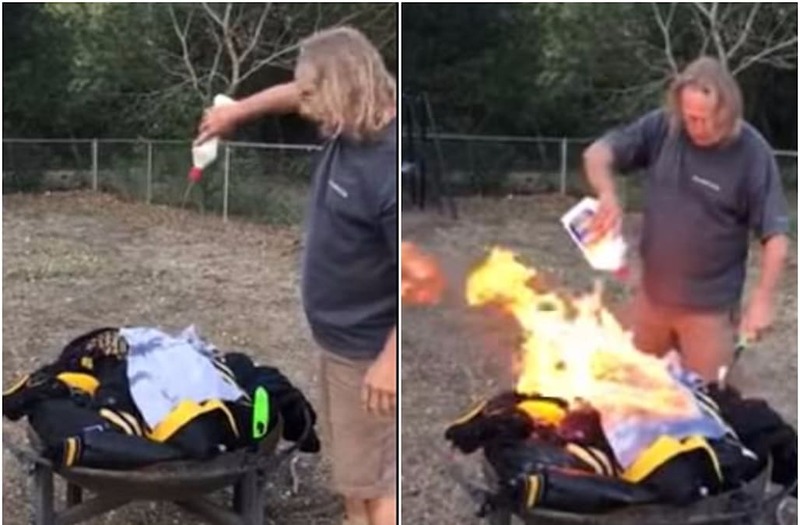 "You have problems with things, that's great," says a woman in a YouTube video during which she burned Ravens merchandise. "But, you don't disrespect the flag and you don't disrespect the people that died for your freedoms. One self-described Seattle Seahawks fan of 40 years posted a video of himself on Twitter lighting a jersey on fire in a trashcan. On Sunday, the Seahawks stayed in their locker room as the national anthem played before their game in Tennessee. Many other people voiced their support online for those burning their jerseys and other gear. #BurnTheNFL I canceled ESPN and will start burning things this evening. When they all stand I will return! Players have said that their decision to kneel or sit is not intended to disrespect the military or veterans, but instead to draw attention to police violence against black Americans and, more recently, issues with Trump's own behavior.